future for our world? It will be people like my friend Kristina. One of the things I've always believed is that if you want to change the earth on a grand scale, you can't just talk about change philosophically and embrace those ideas yourself because most people aren't devoted enough to pursue abstract ideas, even if they seem intriguing. You can do it yourself, but you'll be living a very lonely dream. To get the world moving in a different direction, you have to have concrete institutions in the physical world that bridge the gap between where everyone is now and the better future you envision. Right now we have have liquor stores and 7-elevens crammed with isles of ho hos, and it's hard for people to see a fruit-abundant future. Yet I and people like Kristina can see it clearly and work toward it, and that's the only way we're going to get anywhere. I first met Kristina at Health and Fitness Week 2009, and it didn't take me long to realize she was something special. Kristina is the rare type of person I could envision equally in a corporate board room, running a marathon, or working as a therapist. Her drive, competence, and charisma combine to make her a force to be reckoned with, and she's put her energy to good use in Houston, creating the successfull Rawfully Organic Co-Op, which has sold millions of dollars of locally-grown organic produce to the people of the city since its inception in 2007 while introducing hundreds of people to the benefits of raw foods. Normally the raw food success stories featured on this site focus on adopting a raw food diet and overcoming health problems, but I'm going to glaze over that with Kristina. You can read why she went raw by reading her profile. This interview is going to focus on her innovative co-op and how it's making a difference in the world. Andrew Perlot: Once you went raw, did you see discordance between the new ideology you were embracing and the world around you? How did you feel about it? Kristina Carrillo-Bucaram: It wasn’t until I went raw that I realized that I had been lied to my entire life. Perhaps it wasn’t that I was actually lied to, but it was more that I had never heard the truth. I felt this crazy-weird set of emotions: on one end, I was so completely exhilarated because I felt like I had just stumbled upon the best secret that has ever faced mankind. 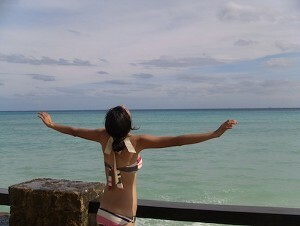 On the other end, I was also hurt, upset, and angry because I realized that my whole life I had been living a lie. I didn’t have to be living in that pain or confusion, but I did because I didn’t know any better. It takes a lot to emotionally recover from 20 years of life living “SAD.” When you step out of it, it is truly one of the most eye opening experiences ever. Most people don’t realize how sick they are until they go raw, even if they don’t have an illness. Now, more than ever, the raw movement has become popular and things are changing; it hasn’t always been this way. People like you are coming out of the woodwork making a difference, and it is awesome! When people are awakened, they become enlightened. Andrew Perlot: How did you get from realizing that whole, raw, ripe, organic fruits and vegetables along with the components of healthy living just make sense for human health, the environment, and morality to trying to start an organization to help foster these things in the world around you? 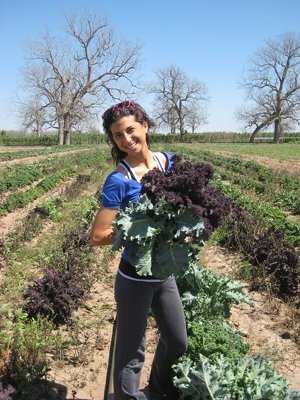 Kristina Carrillo-Bucaram: When you’re raw, there is one thing that will concern you at first: making sure you have a good source of food and having enough of it to sustain yourself. I went raw when I was in college at Vanderbilt University. Nashville is not exactly the most raw-friendly city. Now, its more common for kids in college to be raw; however, back then it was unheard of, and I was the only one in the whole university that was trying to attempt this at the time. I ate nothing but pears, bananas, and lettuce for a whole year because that is all I could find organically. I stored my fruit under my bed and in my closet in my 8 x 8 dorm room, and I even washed my vegetables in the girls’ bathroom sink because I didn’t have my own sink or kitchen to prepare foods. Sourcing good food became not just a necessity, but it was almost an obsession and a dream that I wanted so badly. I wanted an abundance of organic colors, varieties, and tastes! Although I may have been surviving in Nashville, I was not thriving. It was not until I decided to transfer to Rice University in Houston, TX that I was able to truly find my way in sourcing organic produce. Going 100% raw completely changed my life by getting rid of my hypoglycemia. When someone has a humungous shift physically, there is no denying that it can change not only one’s life, but also a community and beyond. Everything about me changed, and it wasn’t just my blood sugar levels. I became an entirely new person. After this transformation, I found it hard to believe that I was the only one that wanted to eat an abundance of raw, ripe, organic and fresh produce. Number Of Families/Members: 3,800, with 300 or more buying per week. Prices: About 30 percent less than you'd pay for organic produce at a high-end supermarket like Whole Foods. Andrew Perlot: Give us the run down of the co-op, it's history (when and how you started it), and it's growth over time. Kristina Carrillo-Bucaram: When I transferred to Rice, all I wanted was an abundance of food. After feeling like was not satisfied in Nashville, I was determined to source as much organic produce as I could find. I wanted the best of the best! At the time I joined the environmental committee at the university, and together, we helped to start the first Rice Farmer’s Market on campus. When it first started, we had tons of local growers come and I had the privilege of making friends with them and building relationships with them. Today, I call them family. Since then, the farmers market has changed completely because there is not as much produce, and there are people there that sell prepared foods, coffees, etc. The produce is definitely lacking. I was so glad to meet these farmers then because I got to them before they left the market. Although I loved buying from them, I still found myself not being able to satisfy my choleric intake by just eating locally because sometimes they would not have enough fruit to support my 3,000 calorie daily diet. At that time, not only was I buying locally, but also I was spending about $300 a week at Whole Foods for both my family and me. By this time, my family had seen me go from wobbly weak to impeccably strong, and they were pretty much on the raw wagon after that. We were going through 5 cases or more of food each week. After doing tons of research and after networking through a friend of a friend of a friend of a friend, I got in contact with a big time distributor who only deals with large grocery chains in Texas. He is the only one who carries organics. I asked him if he would mind delivering to my house if my family ordered a few cases. He laughed at me, but he told me that if I could get a minimum of a 40 case order together, then he would deliver to my house. Let me put this in perspective for you: there are 24 heads of lettuce in one case, there are 40 pounds of bananas in one case, etc. Although I love produce, and we can go through it like crazy, 40 cases was too much for my family. That’s when I thought that if could get a few other friends together in this order, we could probably pull it off. Our first order was split up in my living room with 12 other people, it was the most abundant week of our lives! Each week after that more and more people wanted in, and before we knew it we had 60 families a week picking up out of my garage! Here I am 4 years later with over 3,800 participating families, 3 different venues in Houston, and over 2 million dollars spent on organic produce. Andrew Perlot: How exactly does the co-op function? Besides food distribution, how does it promote community building around the ideals you hold dear? Is there a social aspect? Kristina Carrillo-Bucaram: Since day one this co-op has been completely non-profit. Yes, that means I am not writing myself a paycheck! Although I am the one who still does all of the ordering, purchasing, organization, computing strategizing, coaching, fundraising, website management, recipe posts, and running the show on the day of the co op, I still rely on every helping hand and on every volunteer to make this organization run. We have at least 100 families pick up on each co-op day and I rely on all my volunteers to help prepare for this task. It has become something so much bigger than volunteers coming from week to week; it has become a family. Its not like a grocery store where you just walk in and get food, but you have families every week that come to sort the shares, participate in sharing recipes, give hugs, offer support in the raw lifestyle, and more. The co-op is not a service, and it is not a sale; it’s a community of people centered around the importance of buying fresh, ripe, local and organic in abundance for one’s self and for one’s family. Everyone is truly interested in creating a change in themselves and in the world. Andrew Perlot: What are the co-ops objectives? What makes it unique? Do you see it as a force for improving the world? Has it had an impact on the Houston community? Kristina Carrillo-Bucaram: A co-operative is a community of individuals and families that come together to share in seasonal foods and to work together to create a better balance of peace and harmony for all. It's for everyone, and it is helped run by everyone. Everyone has the ability to contribute in his own way. The boxes are called "shares" because we buy the food in bulk, and we split it amongst everyone. Because it is seasonal and because it is a co-operative, people will not always receive exactly what they want or in the quantities they want. It is learning to share what's available and be cooperative. The best joys can come from being creative with the unexpected surprises in your box and can come from sharing the most delicious and healthiest of foods with your friends and family! One day a Rawfully Organic will exist in every state, it will change this world. Absolutely, we are one of the biggest co-ops in Texas, if not the biggest. To my knowledge, we are spending more money on organic produce than any other organic co-op in Texas. Andrew Perlot: Has the co-op expanded quickly? How many members does it have? How many of them are raw? 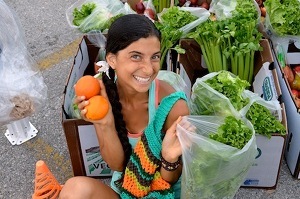 Kristina Carrillo-Bucaram: Anyone and anybody can be in the co-op; we have a vast array of raw foodies, vegetarians, juicers, vegans, or simply foodie lovers. All are welcome and all appreciate the bountiful boxes. Before I started this co-op I barely had any raw friends at all, but now I have more than I could possibly ask for, and almost all of them are raw because of the influence of my lifestyle and the co-op. I am honored to share this with them and it is so much fun to live it with others than to live it by myself. Andrew Perlot: Do you have any special training or skills that helped you do this? Do you have a business background or some previous training running a co-op or nonprofit? Kristina Carrillo-Bucaram: Love for an abundance of food in conjunction with my triple major at Rice University help give me the knowledge and the passion to run this co-op. Although I graduated in the top 5% of my class as a Suma Kum Laude, I never had any non-profit training. I had to learn all of that jargon on the way. Kristina Carrillo-Bucaram: I considerate the act of eating to be holy because it creates the aura that surrounds me and gives me the energy to cooperate, the fuel to run, the rhythm to dance, and the heart to love. I make a living coaching people to live raw, and I am also a practicing ceramicist. I love to dance, sing, and spend time with my family and friends. I also love running!!! Andrew Perlot: Tell us about your future goals for yourself and the co-op. Where do you want to be in 10 years? Kristina Carrillo-Bucaram: My future goals for myself and the co op are one in the same. In 10 years from now there will be a Rawfully Organic in many different cities across the U.S. and potentially world-wide. I plan to travel the globe as a guest speaker promoting not only this lifestyle, but also encouraging organic farming and sourcing local food. I have already started on two different books, and my new website dedicated towards teaching people how to source their food and achieve 100% raw will be out next month. Andrew Perlot: Could you tell me a bit about the raw food advocacy aspect of the co-op? 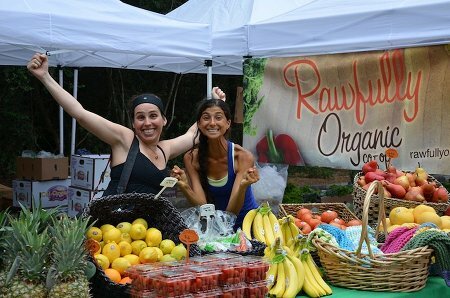 Kristina Carrillo-Bucaram: The co-op is completely centered around eating raw and living a raw food's lifestyle--hence the name Rawfully Organic. 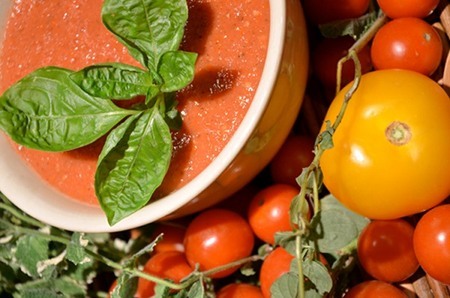 It places emphasis not only on eating raw, but in eating pure, organic produce. The boxes ONLY contain produce, and the co-op does not sell other packaged goods. It's all about the BOX baby! More often than not, you will hear someone say, "Oh, I am SO excited about my box!" 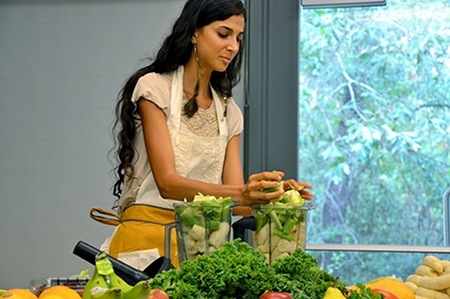 I am frequently teaching raw foods classes in the Houston area about eating raw, and every season, the Houston Arboretum hosts my EAT IT RAW preparation class demo, where I make a 3-4 course meal for at least 60 people. During this class, I do nothing but rep the raw! I do about 3-4 raw food presentations, talks, or classes each month in the Houston area. I would like to branch out more. Next month, my new raw website will be out, teaching people how to be 100% raw. Top-secret stuff until it comes out, but I am SO excited for it! All will benefit from the coolness of this site! Rawfully Organic is a source for food. This site will be the sister site that teaches them how to achieve this higher level of living. The ROC website also send out free raw recipes each week of menu ideas that you can make STRAIGHT from your box that are completely 811 low fat raw vegan! I also send out a weekly email newsletter to everyone in the co-op (and not in the co-op) inspiring them to eat raw and to live a healthier lifestyle. I truly believe that it is all about shifting one's perception to make this world a better place. Kristina Carrillo-Bucaram: When I was first raw in Houston, I knew ONE other person who was raw. That's it. Today, I know about 4,000 Houstonians who know about the raw movement because of our beloved co-op. Many of my closest friends are now raw or attempting...too many friends to even give you a number! 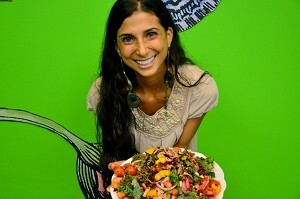 Learn how to eat the healthy low fat raw vegan diet Kristina Carrillo-Bucaram promotes through her co-op. Learn the importance of getting produce in bulk to fuel your raw food diet while saving you money. Read other raw food success stories.